Hummingbirds flutter from flower to flower seeking nectar to the delight of gardeners everywhere. You might only catch a glimpse as they pause for a drink or hear the brief hum their wings beating as they go by. Once you’ve experienced your first sighting in the garden you will probably find yourself enticing them to linger. The Ruby-Throated Hummingbird is our regional species. This is the smallest type of hummingbird, weighing less than an ounce and reaching 3 to 3 ¾ inches in adulthood, with a wingspan of 4 to 4 ¾ inches. They have amazing abilities to fly forward, backward, and hover in one place. They tend to fly solo, so the more feeding options the better chance you will see multiple birds throughout the season. 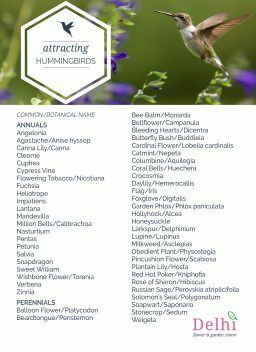 Hummingbird gardens work best when they are planted with a diverse mix of annuals, perennials, vines, shrubs, and trees. The annuals will bring in fast color and nectar while the perennials and hardy material will invite them back year after year. Look for blooms with flower tubes and plants at various heights. Keep in mind you’re not limited to red flowers but can choose flowers in purple, yellow, orange, white, pink, and blue hues as these will also have nectar. 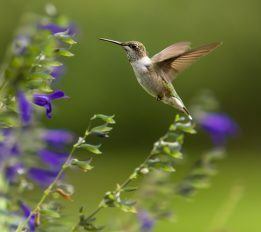 While hummingbirds get most of their energy from nectar found in flowers, they do gain added protein by eating small spiders and soft-bodied insects. Bonus! A hummingbird feeder is a good idea when you consider that an adult hummingbird needs about 1,000 blossoms each day to survive. A feeder is a fast and easy way for hummingbirds to perch and drink. Feeders should be cleaned often during the hot summer months as the sugar will ferment and could easily cause deadly salmonella poisoning to hummingbirds. Peak feeder activity seems to be early morning and late evening. Increased activity has also been noted before major thunderstorms. A simple feeder recipe is one part sugar dissolved in four parts boiling water that should be cooled before serving. You don’t have to add red food coloring (commonly believed, but not so) and should not use honey.